So how exactly do we jump on the bandwagon for this? this intrigues me greatly. I like just about anything... Do not take that the wrong way got that? 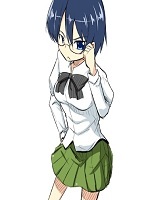 Is it possible to buy a Shizune one as well? All the information is in this thread. I do however have a damaged Shizune figure that I'm thinking of selling. If anyone is interested, pm me. Be warned that you will need to do some work in order to fix it up. Also to those interested in making a new one, there was a post on the first page, but I'll post again. I've sent back and forth emails for two months trying to create the Shizune figure, and I'm sure if you're interested you can get the same one. Just email her about getting the same figure done and maybe attach on my picture, and I'm sure you can get a perhaps discounted price on a figure. The mold and such is already completed, so it would only take maybe a week or so for it to be created. And another reminder, I do have a broken figure that I am willing to sell. Price is absolutely not fixed, and I'll be willing to talk about it if you're interested. Congratulations, this topic has brought me out of the KS Forums retirement. I have a right mind at this point to purchase a 3D printer for $600-$2000 (The Robo 3D is looking good) and use a little computer generated artistry to design the girls. Considering that PLA plastic can easily be painted over with acrylic paints, which can then be thinned for airbrushing, I see this as more of an affordable option if someone was looking into producing their own figures. Also would work for me on designed OCs for my future endeavors; considering people asking me to go off the idea I had in a livestream...The Visual Novel "Hadaka-Apron Neko Maid Cafe". Now have fun and ponder, while I ponder taking my PS4 fund and applying it to that printer. neumanproductions wrote: Congratulations, this topic has brought me out of the KS Forums retirement. also, isn't that printer for only small parts like bolts or something? pandaphil wrote: If I had a few thousand to spare I would definitely invest in a 3d printer. I'm not really angry, just frustrated is all. I would love to have KS figures, t-shirts, posters, etc, and would quite literally throw my money at the devs if they were to offer such things. I agree... If the devs could figure out some way to sell merchandise, i would immediately jump on the bandwagon. T-shirts man, I'd buy a hundred. I would have my own practical uses, as I mentioned I do have my own production plans in the future and this would just require me taking my PS4 fund for this year and converting it to another direction. But certainly I would discuss with the devs as they have essentially taken away my concept of acting as producer into a webisode series of the KS Universe. Kickstarter has been making me look in depth for several of my associated projects. I'm down for the Hanako figure. Where do I send the moneys. Jack desu wrote: I'm down for the Hanako figure. Where do I send the moneys. ... provide pictures, be very specific with what you want, and haggle. Be prepared to shell out some cash, it's expensive as hell. Why don't you post your ideas here before sending them to Cindy. I'd love to see them! oh, my, god.... they're SO FREAKING AWESOME!!!! !